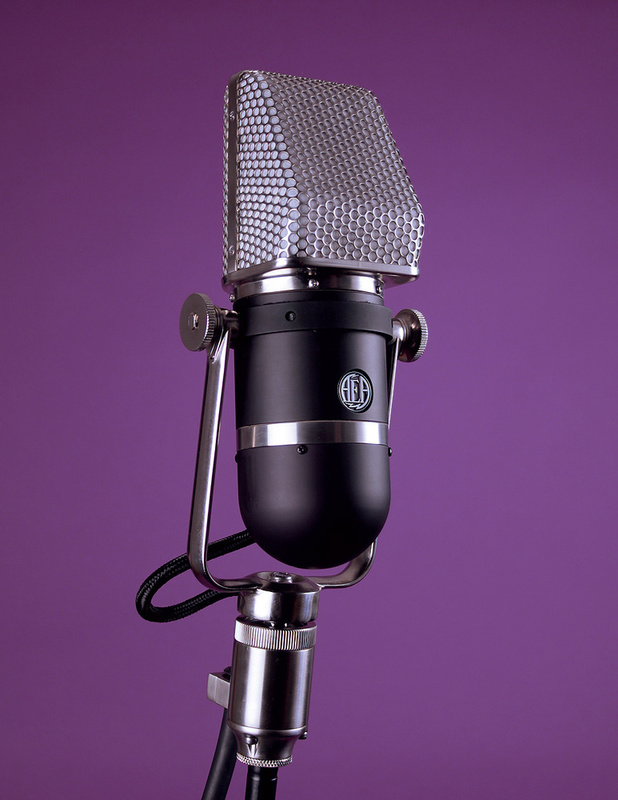 This lovely mic from AEA is based on a classic RCA design from the '40s. It certainly looks the part, but is it worth the asking price? When the 'ribbon microphone' comes up in a discussion, most people will automatically assume that the mic in question has a figure‑of-eight polar pattern — after all, the vast majority do! Compared with other capsule technologies, the practicalities of building a ribbon microphone make it harder to deliver a variety of polar patterns, and the nature of the ribbon itself naturally pre‑disposes it to velocity (pressure-gradient) operation, which means a figure‑of‑eight polar pattern. To put some numbers on that notion, of the 58 ribbon microphones currently listed on www.microphone-data.com, 55 have a figure‑of‑eight polar pattern. Two of the remaining three (the Beyerdynamic M160 and M260) are hypercardioids, and the last is the cardioid RCA KU3A — but that particular mic is long since out of production, and is only listed for historical interest. Although not listed on the site, Silvia Classics make a cardioid ribbon mic called the SC5C, which looks similar in design to the long-deleted RCA BK5. However, there is no intrinsic link between the electro-mechanical nature of a microphone, be it electret, capacitor, ribbon or moving-coil, and its acoustical properties (pressure or velocity operation, or a combination of both). We are quite used to capacitor mics being available with omnidirectional, cardioid, hypercardioid or figure‑of-eight polar patterns and, in theory at least, a ribbon microphone could be constructed to deliver the same range of pickup patterns if so desired. All of which brings us neatly to the subject of this review: Audio Engineering Associate's new KU4 'unidirectional' ribbon. And if you've noticed a similarity between this new model's name and that of the RCA classic I mentioned above, that's because the KU4 'celebrates' the KU3A. You can read more about the original KU3A microphone in the 'Blast From The Past' box. AEA are very well known specialist ribbon‑microphone manufacturers and also have a strong pedigree in repairing and restoring classic ribbon microphones. Simultaneously, they have built quite a reputation for their modern 'reincarnations' of some of those original RCA designs, as well as their own bespoke models. I've reviewed many in the past, including the A440 (June 2009), the R44C (June 2002), the R92 (April 2007), and the R84 (February 2004), as well as the company's purpose‑designed TRP and RPQ ribbon-mic preamps (April 2007 and October 2008, respectively). The company's new KU4 microphone is a very close derivative — a modern recreation, if you like — of the original RCA KU3A, and even uses new‑old‑stock (NOS) RCA ribbon material. The similarity in design is emphasised by the fact that some parts are directly interchangeable with the original model. While surviving samples of the KU3A are rare, it remains a much revered microphone for its sound quality. However, I'm told that finding two examples that sound remotely similar is extremely difficult, partly because of the effects of ageing and partly because manufacturing consistency was notoriously poor. Apparently it has taken AEA's boffins over two years to develop and fine‑tune the design and manufacturing process of the labyrinth chamber in the KU4 to achieve the level of consistency that modern customers require — and to prove the point, KU4s are available as matched pairs for stereo applications, if your bank manager is obliging enough! The KU4 is supplied inside a zip‑closed, soft‑cotton twill bag intended to prevent dust and draughts from affecting the ribbon while in storage (the bag can also be used to protect the mic while mounted on a stand but not in use). The bagged mic is protected from knocks when in storage and shipping by a burgundy nylon/Cordura case lined with a sturdy foam insert, and the storage case is designed to encourage the user to store the microphone in a vertical orientation to reduce the risk of 'ribbon sag'. The KU4 has an integral (but removable) stand adaptor, a 10‑page A4‑sized manual, and a permanently attached two‑metre microphone cable. The cable, which I believe is Accusound Silver Studio Pro, has a vintage‑style woven cloth exterior and is terminated in a Switchcraft XLR plug. (The original KU3A employed a large F&E three‑pin connector, mounted at an angle on the top rear side, to provide the output signal.) The microphone is covered by a three-year parts and labour warranty, but there is nothing in the microphone that has a limited lifespan, so it should provide decades of service provided it is handled and used with respect. The KU4 is about the same size as the original KU3A, measuring 324 x 117 x 95mm (HWD), including the mounting bracket. The KU4 appears to be heavier in its mounting bracket than the KU3A, at a massive 2.15kg, so this microphone needs a very substantial microphone stand, and if it is mounted on a boom arm, a serious counterweight will be required too. The KU4's sensitivity is listed as 2.5mV/Pa (about 1.5dB lower than the original), maximum SPL is 140dB, and recommended load impedance is 10kΩ or higher. This last point is worth noting, as most mic preamps present an input impedance of between 1kΩ and 2kΩ. In contrast, most ribbons prefer to see considerably higher loads, which is why AEA's own mic preamps have input impedances of 18kΩ or so! (The original KU3A's output transformer could be adjusted for 30Ω, 150Ω or 250Ω output impedances). The microphone's polar pattern is a well‑defined supercardioid (the KU3A was claimed to have a cardioid pattern, although most actually had a hypercardioid response), with deep rear minima at 135 and 225 degrees. AEA found that the best compromise between on‑axis frequency response and consistency of the off‑axis response around the polar pattern was achieved with a supercardioid pattern. As you might expect, the polar pattern narrows across the front quite rapidly for extreme HF sounds (10kHz being 5dB down by ±45 degrees off‑axis, for example), but it actually has quite a wide pickup angle across most of the audio spectrum, with the ‑6dB points being about ±75 degrees. The ribbon itself is relatively large, measuring 2.1mm wide by 28.6mm long, and is made from pure aluminium measuring just 1.8 microns (0.0018mm) thick. The distinctive grille basket and the suspension yoke assembly are completely interchangeable with those parts of the original KU3A, but the internal mechanical design is entirely different, as AEA have employed more modern construction techniques to ensure both tighter tolerances and a more consistent sound character from unit to unit. The design also makes it practical to replace the pole‑piece and ribbon assembly in the field, if necessary. Most KU3As were slung from overhead microphone booms (either fixed or mobile), as is the norm for film and TV studios, and all manner of custom suspensions were employed, providing shockmounting and often allowing the mic to be 'steered' as necessary. The KU4 is provided with a much simpler removable mounting‑yoke assembly, which has been derived from that used on AEA's R44 series microphones. It incorporates a flexible 'cushion' mount system in the base of the yoke to provide a useful degree of vibration isolation. Like most ribbon mics, the KU4 is actually far more robust than most people assume, but it can be severely damaged if used carelessly. The mic will tolerate proper phantom power quite happily, but as a momentary imbalance in the voltage on each side of the balanced output might damage or even destroy the ribbon, the safest advice is to avoid phantom power if possible or, if not, then avoid hot‑plugging the mic while phantom is active — and always check that your mic cables don't have any short or open connections before using them to connect a ribbon mic! A more common and likely cause of damage is to expose the microphone to strong air currents. The KU4 can cope with extremely loud sound pressure levels without any problems at all (140dB SPL produces just 1 percent third‑harmonic distortion), but a small gust of wind can stretch the ribbon irreparably, reducing sensitivity and skewing the frequency response forever! For this reason, care must be taken to avoid exposing the microphone to any kind of wind blast at all times. So when not in use, the microphone should either be packed away properly or covered with a bag (the supplied cotton bag or a clean polythene bag, for example) to protect it from accidental draughts. When considering where to place a ribbon mic for a given sound source, it is good practice to test the environment for strong air movement with the back of a hand first. If you can feel moving air when the source is playing, consider placing the mic somewhere else or protecting it with a pop screen. Angling the mic at 45 degrees to the sound source also helps to reduce the risk of damage, albeit with a slight change to the tonality. I've known ribbon mics to be destroyed by the puff of air from a modest guitar cabinet on the first note of a power chord, so it pays to be cautious! Most pure pressure‑gradient (figure‑of‑eight pattern) ribbons exhibit a strong proximity (bass tip‑up) effect but, because of the significant element of pressure operation employed by the KU4 to achieve its supercardioid response, it suffers less proximity effect compared with typical figure‑of‑eight ribbon mics. Reasonably close placement can therefore be used without excessive bass bloom, if required. As a result, AEA recommend the KU4 for a wide range of applications including low strings, brass and vocals. Like all ribbons, the KU4's diaphragm and suspension are tuned to resonate at a very low frequency (well below 20Hz), which plays a large part in the characteristically smooth high end and the very naturalistic sound associated with ribbons generally. In contrast, capacitor microphone diaphragms tend to be tuned to a high frequency (typically in the 15‑20kHz region) and this inherent HF resonance can result in ringing and an edginess or harshness if not well controlled. Although the KU4's response tails off quite steeply above 10kHz, it actually rallies again above 16kHz or so, which helps to preserve the transient details of percussive sources very nicely, and retains a sense of air and space without ever sounding abrasive or harsh. I found the KU4 to be a sublime microphone, sharing a similarly expansive character to AEA's other large ribbon mics, lending voices and instruments a wonderful 'scale' and body that is often hard to match with capacitor mics. The polar pattern is controlled extremely well, and the off‑axis sound character is remarkably smooth and consistent, putting many modern mics to shame with its minimal coloration! On percussive and stringed instruments the microphone reveals a fast, precise character, with a warm, rich bass response and a silky smooth treble that is easy on the ear but still clear and detailed. Nothing seems to capture brass as naturally as a ribbon, and the KU4 certainly doesn't disappoint here — and it can cope with close placement quite comfortably. I'm a big fan of ribbon microphones generally, but the first to admit that the near-universal figure‑of‑eight polar pattern isn't always very convenient. The combination of classic ribbon smoothness with a near‑cardioid polar pattern is a very beguiling permutation that enables the use of ribbon mics in situations that are normally inappropriate or too challenging. The KU4's only practical limitation, really, is due to its vast size and huge weight, but if you have mic stands that are up to the job it's hard to think of an application that wouldn't benefit from a KU4! However, it's all well and good loving the sound of a microphone, but is it a sound buy? At over £5000 in the UK, few home studios will be able to justify the purchase of a KU4, although people are often prepared to invest that kind of money in boutique 'homage' microphones. If you're lucky enough to find an original KU3A in good condition (or refurbished well), it will set you back the best part of $4000 — and no two examples are likely to sound exactly the same, so the list price of the KU4 is not as mad as it might seem at first. The AEA KU4 is, apparently, a really difficult microphone to make, and is hand‑built to look and sound beautiful — and to sound like all the other KU4s, which is a worthy bonus! If your numbers come up on the Lottery this weekend, I would encourage you to invest in a pair of KU4s — and it would be an investment. The rest of us will have to dream, but at least I've had the privilege of using one in earnest. There is nothing currently in production that really comes close to the sound or styling of the KU4, although other hypercardioid and supercardioid ribbon mics are available in the form of the Beyerdynamic M160 and M260, and the Silvia Classics SC5C. Vintage RCA KU3As are very rare, just as expensive and rather more variable in tonal quality! The RCA KU3A was introduced in 1948, and was designed to meet the specific needs of Hollywood sound stages, particularly for use on booms, although it was later very popular as a TV studio mic too. It is occasionally referred to by its manufacturing number, M10001, and it was RCA's most expensive and rarest ribbon mic. In fact, fewer than 600 were produced in total, which is why they are such valuable collectors' items today. The operational instructions advised suspending the microphone at 45 degrees to the floor (the ribbon is mounted on the vertical axis, not parallel with the sloping front grille), and the marketing brochure boasted about the microphone's small size and light weight! By modern standards, the KU3A was both huge and extremely heavy. The KU3A essentially combined the fundamental ribbon design of that other RCA classic, the equally huge and heavy 44BX, with a complex and elaborately constructed acoustical labyrinth housed in the cylindrical body. This labyrinth (basically a folded pipe with internal damping) provided an acoustic delay for sound en route to the rear side of the ribbon diaphragm, and in doing so introduced an element of pressure operation to the capsule, bestowing it with a more cardioid‑like polar pattern. A welcome bonus of a cardioid response is a reduced proximity effect compared to a pure velocity or pressure‑gradient figure‑of‑eight mic, and the microphone quickly became a familiar and popular feature of film studio sound stages around the world. The KU3A was remarkably sensitive for a ribbon, at about 3mV/Pa, and the frequency response extended comfortably between 30Hz and 15kHz, with a modest presence boost between 2 and 6 kHz. However, its real claim to fame was the accuracy of the cardioid polar pattern, which was quite remarkable for its time and a substantial improvement on previous techniques to achieve a cardioid polar pattern, most of which employed either two physically separate capsules (usually a moving-coil pressure element and a ribbon velocity element), or one or two parallel ribbon elements with one (or a half of the single ribbon) closed off at the rear for pressure operation. 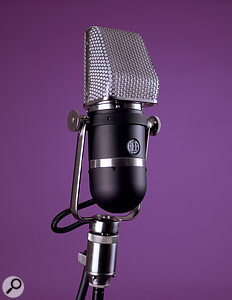 The STC 4033A is a prime example of the former approach, while one of the KU3A's sister microphones, the 77 (designed in 1932) employed the latter technique. The RCA 77 (in its suffix A and B versions) provided a fixed cardioid pattern by placing half of its ribbon diaphragm in an acoustically terminated chamber to create a pressure element. The suffix C version (introduced in the late 1940s) allowed the two halves of the ribbon to be selected electrically to produce switchable omni, cardioid or figure‑of‑eight patterns, while the suffix D and DX versions used a mechanical rear shutter to produce omni, cardioid, hyper‑cardioid and figure‑of‑eight polar patterns. However, because the KU3A was designed from the outset as a fixed cardioid‑pattern mic, the ribbon motor assembly and the acoustic labyrinth could be optimised to achieve an extremely consistent frequency response both on and off‑axis — which was outstanding for the time and is still very impressive today. Silky smooth ribbon character with a supercardioid polar pattern. AEA have taken considerable time and effort to deliver what the KU3A promised. There is always something special about the sound of a good ribbon mic, and this reincarnation of the KU3A is stunning in every sense. I've said this before about AEA's classic mics but it remains true: they are expensive and revered, like a vintage Bentley, but not easy to justify to the accountants.